Blue Poppy has been blowing our minds with delectable Tibetan fare. Now, with their new eatery Thakali, they are all set to amaze us with some lip-smacking Nepali fare. Wondering what Thakali means? 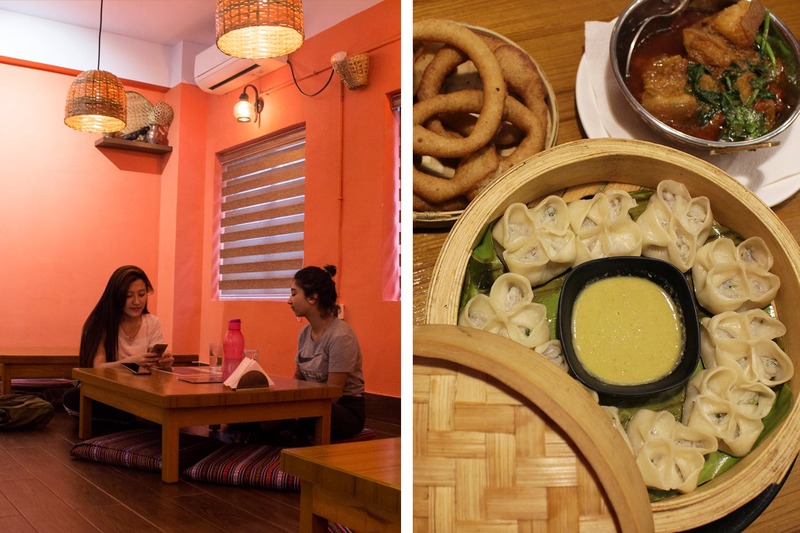 Well, Thakali is a tribe of Nepal that resides along Thak Khola or the Thak River, and Blue Poppy’s new eatery promises to bring their cuisine to us. Located inside the first building of Sikkim House in Middleton Row, Blue Poppy Thakali is high on Buddhist and Nepali culture. The upcycled decor of woven cane is best offset by the beautiful brass Nepali Nawara lamps and the intricate wooden Nepali peacock windows. Sit on the mattresses by the low tables or on the usual one, but you’ve got to try the thali to get a taste of Thakali. The Thakali cuisine is a rather simple one, dominated mostly by their thali. The thali makes for a whole meal with portions of rice, bread, black dal, meat or veg sabzi, greens and salad. What, of course, sets this thali apart is the presence of at least three types of achaar (pickle) in it. The Thakalis take their achaars seriously and make several types of them to compliment different dishes. Besides the typical Thakali thali, the other thing that you must try when at Blue Poppy Thakali is the Nepali essential dish of Sel Roti. This deep fried sweet bread will seem like a marriage of a donut and malpua for Bengalis. Tempered with aniseed, this sweet pretzel-like bread is best complimented with the Nepali Alu Dam and the amazing pork curry of Blue Poppy. Blue Poppy was known for momos. Thakali does momos with a twist- you’ve got to try their open momos that are best complimented with the spicy sesame achaar. These momos have a flower shape and an open top (you can see the stuffing). You can go for the regular chicken, mutton, pork or veg options, but we suggest you try the Nepali alu cheese momo that comes stuffed with spicy alu topped with cheese. Besides these mains, you must also try their pickled pork trotters, their smoked chicken or pork salad (better known as choila) and their Kinema (fermented soya beans best had with rice and dal). The open momo prices start at INR 180 and sel roti at INR 200. The thalis on the other hand start at INR 250. With the delicious food not burning any hole into our pockets, we can’t wait to get back to this place. Check here for more info.